Diamante Plaza is a modern A-class office building located at Jana Dekerta 24 in Kraków’s Zabłocie, an up-and-coming neighbourhood offering convenient transport links. Due to its attractive location (quick access to the centre and the city’s other neighbourhoods by public and private transport) and the high quality of space available, it proves to be an interesting solution for both private companies and local government authorities. Kraków City Hall has recognized the positive qualities of the location, in particular its accessibility, and will be moving its Department of Social Policy and Health to the building to provide services to the city’s residents with disabilities. The space amounting to 637 sqm will include a general enquiries and help desk area and medical consulting rooms. Thanks to the building’s location and surroundings, the future office to be based at ul. Dekerta 24 will undoubtedly become a disability-friendly place, additionally supporting non-governmental organizations working in the field of people with disabilities. Furthermore, the space leased has been arranged in a manner that enables those seeking services such as those provided by the Municipal Disability Assessment Board to comprehensively handle all their affairs: starting with submission of an application, through to meetings with disability assessment panels and issuance of an assessment certificate, disabled identification card, disabled parking permit as well as the so-called N-card (issued to families with disabled children). This will be possible due to the fact that all the certifying physicians will now work from one single location instead of two separate medical centres at ul. Kutrzeby and Al. Pokoju (as is the case at the moment). In turn, applications for issuance of assessment certificates, disabled identification cards and disabled parking permits are currently submitted at ul. Stachowicza 18, where the required documents are then subsequently issued and have to be picked up from). The planned location and the practical design and layout of the space to be occupied by the Department of Social Policy and Health will significantly improve the quality of the service rendered to clients with disabilities. The spacious and comfortable help desk area (capacious waiting room, chairs, air-conditioning and six individual help desks) will certainly improve the experience and reduce the waiting time involved when submitting the relevant applications. Moreover, placing all the certifying physicians’ offices in one location will streamline the Board’s operations and expedite the whole process. Implementation of the lease transaction for the office space was supported by experts from the Office Agency Department at BNP Paribas Real Estate Poland. Kraków City Hall is not the only new tenant to be moving to Diamante Plaza. The group of entities now leasing the commercial space available in this office building includes the Żabka convenience store chain, where it will occupy ground-floor premises with an area of 135 sqm. The building offers 10 000 sqm of leasable modern office space spread across four storeys. 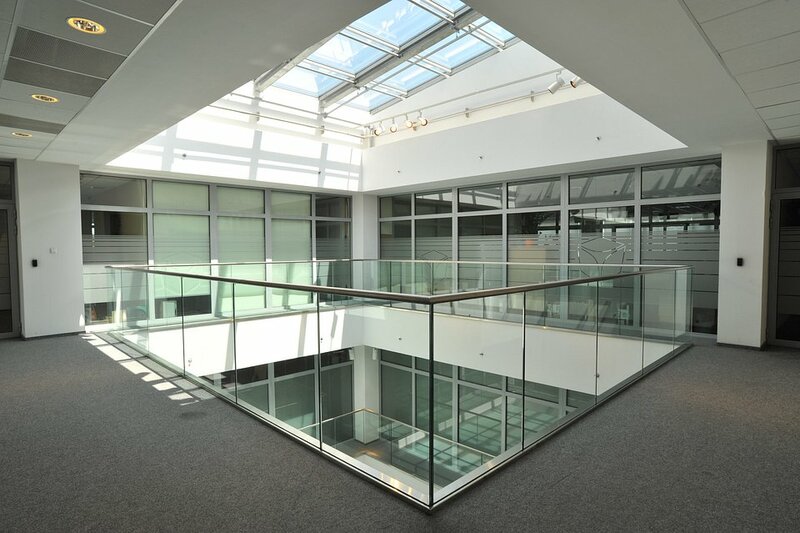 Additionally, the scheme accommodates a lunch bar, two conference rooms, a playschool and 193 parking spaces in a two-storey underground car park. BNP Paribas Real Estate Poland represented First Property in the successful acquisition of Krakow Business Park (KBP).